Here is our new alpha version of the Duckbill modules that were anchored on the belt that we can now manufacture to migrate and fit on the Molle type vest. Our sharp, smaller / profiled design takes less space on the vest. Our look is more in line with the police type look than the military look. The reason for this is that we have a specific holster design rather than a load carrying pouch design. As we previously mentioned Duckbill is an integrator and wishes that the overall look with the Molle vest now coming into play has a definite look strategy. Modules on the belt are exactly the same module you find on the vest.The material finishes and the design are exactly the same. 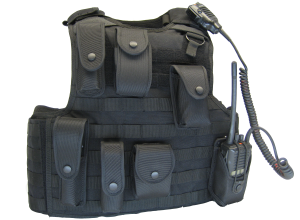 There is uniformity between the modules on the belt and the ones on the vest. Both match and the finish look is what we are looking for: sharp and uniform. our users have to say! Appreciation of the no-keepers design.